The Delco Professional 90-6YR that came with my Z06 was never very strong. If you let the car sit for much more than about a week, the battery wouldn't have enough juice left to start the engine. It's said the C6 has a larger "key off" electrical load than most vehicles but I don't believe this explains the issues I was having. My theory is the dealer killed it; the battery was dead when I picked up the car and so of course they used one of their 100 A nuclear powered rapid chargers. I think the combination of letting the battery fully discharge while sitting on the showroom floor and then subjecting it to a high current quick charge severely damaged it. Before it was two years old, I had had enough and decided to replace the marginal Delco with an Optima. I've used Optima batteries in other vehicles and never had any issues with them. They are resistant to vibration, an important feature when you have a stiff suspension. Not a wet cell and not a gel cell, I like to think of the Optima as a damp cell. It uses absorbent glass mat separators to contain the electrolyte. A major consideration when upgrading to an aftermarket battery physical size; you need something that will fit. But the Z06 has additional requirements. One is the terminal layout. Normally when facing a battery with the terminals closest to you, the positive terminal is on the left. 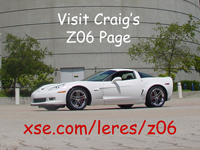 The Z06 has a reverse terminal configuration. Another requirement results from the fact that lead acid chemistry batteries can produce hydrogen during charging. This means if the battery is located inside the passenger compartment or trunk, it must to be vented outside the vehicle. Normally the Optima does not vent hydrogen gas but and has the potential to when charged aggressively. The Optima model 78 has vent tube holes like those found on the Delco Professional 90-6YR. It's slightly larger than the Delco but the biggest problem is that it has GM style side terminal connections. I decided I would rather deal with the lack of posts than lack of vent holes so I ordered one. I tried a lot of things in the end I did a little thinking outside the box and used one of the features of the Optima battery; I installed it on its side. It's narrower than it is tall and just fits. Once on its side, the terminals are easily converted to posts using a set of Lynx LCSTCP2 side terminal charging posts. This results in a perfect reverse terminal configuration! The hold down bolts were too short so I made extenders with M6 X 1.0 screws and threaded hex parts I found at my local hardware store. The factory battery hold down bracket is designed to fit the profile of the top of the Delco Professional and wasn't really compatible with the Optima so I made a replacement out of a piece of 1/2" acyclic. I drilled the holes large enough to accommodate my hex bolt extenders. This worked well since the nut/washers are bigger than the holes. I used a propane torch to flame polish the cut edges of the acyclic. The vent plug and vent tube transferred nicely from the OEM battery. The Optima 78 weighs 16% more than the Delco Professional but it also has 36% more cold cranking amps. The PDF for the Optima model 78 battery (December 2008) does not mention that it has vent holes. Both the Optima and the Delco batteries were made in Mexico. I'm not sure if it was absolutely necessary but I ended up cutting out a section of plastic trim from the rearmost part of the opening. It was necessary to bend the factory battery clamps.